Android devices are getting more powerful day by day, and each new day is a scope for new developers to submit their own apps on the Google Play Store; so that we complain about the non-existence of a particular category of app on the store. It is always a vigorous idea to update the old apps regularly, so that your app, as well as the device, can perform in a harmonized manner, and you can get the best experience of using the app. However, if you still want to know how to install an old version of new apps then here is the tutorial. Updates for various apps are not only limited to new features, as numerous bugs are also resolved, once in a blue moon. New kind of exploits are also coming, which can be used to exploit various apps, and the app updates also come with fixations to keep your app and the device free from any kind of loopholes, which can easily be used for the welfare of the hackers. It is not at all recommend to use the older version of the Android apps, and they are thus, not officially available on the Google Play Store. At the time of downloading an app from the Play Store, you will always get the latest version, and there are no other ways to download the older versions of the same app from the store. Though, updates are always meant for good, but sometimes the developers can also break the app by adding unwanted features, which make the app more cluttered and make the performance worse. If you can’t believe, just have a look at the old version of ES File Explorer, and the version, which is presently available on the Play Store. There are a hell and heaven difference between the versions. ES File Explorer used to be my favorite file manager for Android but now discarded the same for the unwanted features, which were added by the developers in the contemporary versions. If you are having no other option and want to madly download the old version of a new app, sideloading the apps from other sources is the only option, which is available to you. 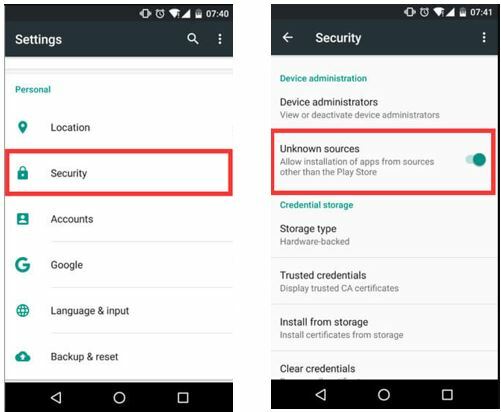 If you are going to sideload apps, you should always pay a lot of importance to the source, as downloading an old version of apps from unauthorized sources can eventually be a threat to your privacy. Not all the third-party websites also allow you to get the oldest version of the apps, which are available. Before proceeding with the steps to download older versions of Android apps, you need to turn on installation from unknown sources, by going to your device settings. Tap on “Security” and turn on “Unknown Sources”. There are so many websites available online to download and install the previous version of an Android app. But the best way is to contact the developer of that which is much secure than downloading from any third party app store. However, I will personally recommend you to download the older version of the new apps, from apkmirror.com or uptodown.com, as it is better compared to other sources. On the two websites, you can also find the old versions of the new apps and the download process is also quite mainstream, and you can even do that, even if you are not a tech expert. For other opensource apps for Android, you can also visit the F-Droid . 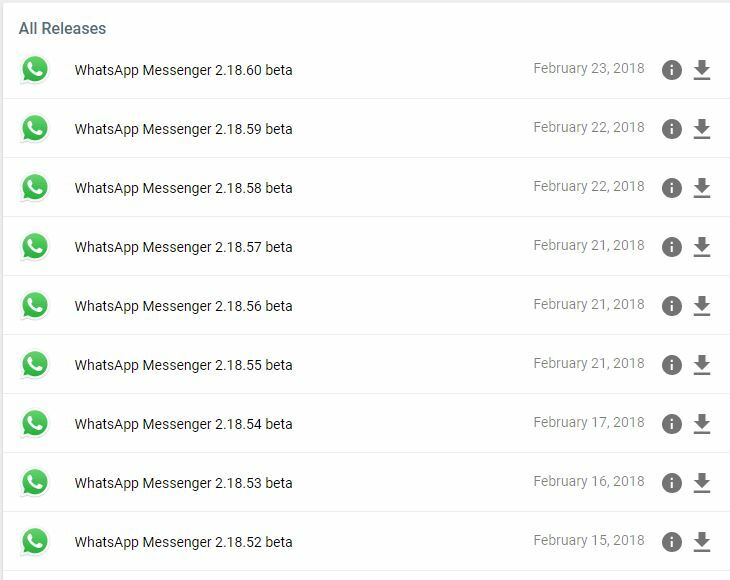 A screenshot from the APKmirror website listing all older version of Whatsapp for Android smartphones. The Android apps come with the extension “apk”, and once it is downloaded, you will have to open the “Downloads” folder, within your file manager, or directly access the “Downloads” app, which one is suitable to you. Just click on the app, and check the permissions, which the app is asking for, click on “Next”, multiple times unless you find the option saying “Install”. Once you tap on the “Install” button, the process of installation will start, and it will take a few seconds depending upon the size of the app. Now, you can find the old version of the same app within your app drawer. If you have turned on automatic updates from your Google Play Store, you should disable it to keep using the old versions of the apps. The Android devices are configured to install the latest updates for the existing apps when you connect to your Wi-Fi network. In order to disable automatic updates, you can follow the steps given here. Open Google Play Store and head to settings. Automatic update of apps can sometimes be a stupid idea, if you connect to a Wi-Fi in the coffee shop, and squeeze the battery when you can do the same task on your home Wi-Fi. But always update the other Android apps from time to time, in order to keep the apps, performing smoothly. There are some great apps on the Play Store, which are worth falling in love with. There is no guarantee, the app will remain the same in the upcoming versions. Just take a backup of the app and store it in some safe place, so that you can install the same later on. There are numerous apps for backing up apps, and most of the third party file manager apps can help you back up the apps to external storage, or directly to the cloud.